News from Our Waking Planet! 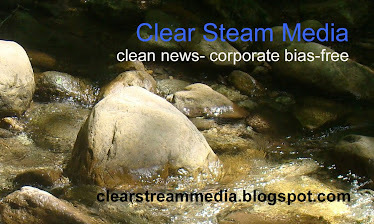 Alternative Media - Use, Support and Share! 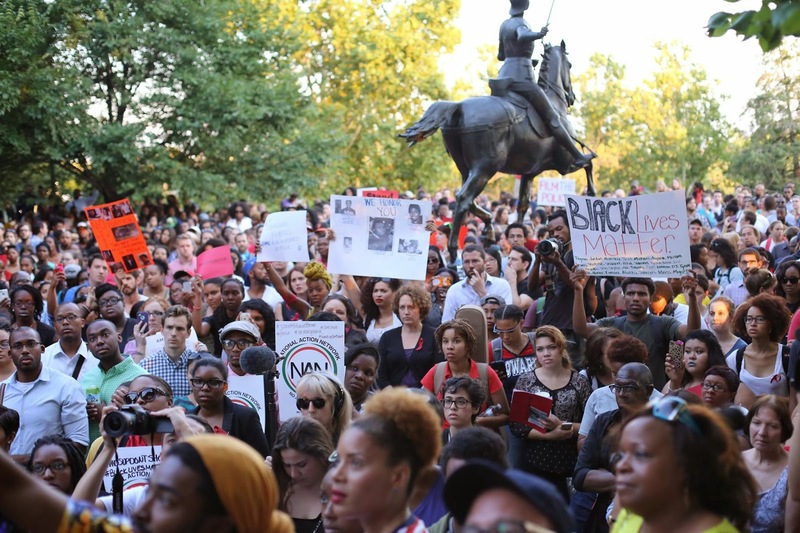 Thousands of Americans took to the streets last night in about 100 cities (including Kingston and Poughkeepsie) for a National Moment of Silence #NMOS14 to demand justice for Michael Brown, the unarmed teen shot and killed last Saturday by a police officer in Ferguson, Missouri. They also gathered to show their solidarity with the people of Ferguson and to remember all victims of police brutality. 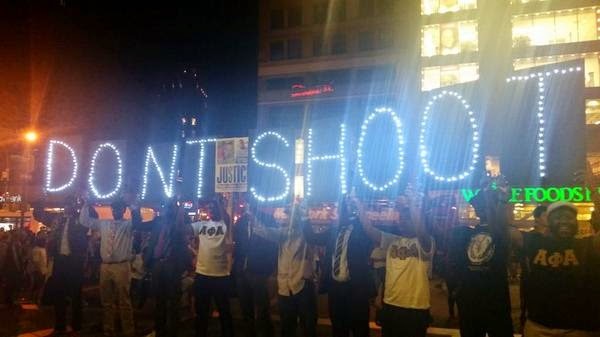 Protesters from Times Square to Oakland, held their hands up and chanted, "Hands Up, Don't Shoot". Three eye witnesses say Michael Brown was shot in the back, and when he turned around with his hands up, he was shot multiple times. 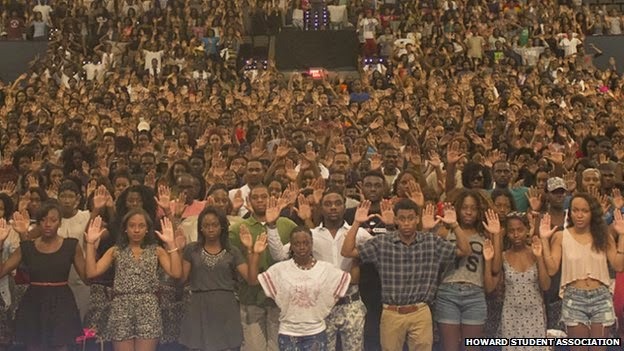 Mike Brown was the fifth, unarmed Black male to be killed by police in a month. Most of us have seen the video of Eric Garner,43, being choked to death, and there was: John Crawford, 22, who was shot and killed walking with a BB gun in Walmart that sells BB guns, Ezell Ford, 25 who was lying on the ground complying with orders when he was shot in the back and Dante Parker, 36, who was stopped riding his bike (because a robbery suspect had fled on a bike- Dante had no criminal record) and he was Tased to death. There is no national database of police killings, which is in itself criminal, but you can see the names of just some of the unarmed, black males killed by police at the end of this post. It is not at all complete. 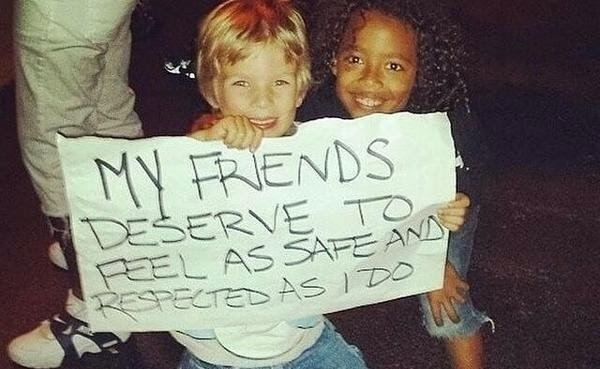 The initial reports from Ferguson were shockingly disturbing. 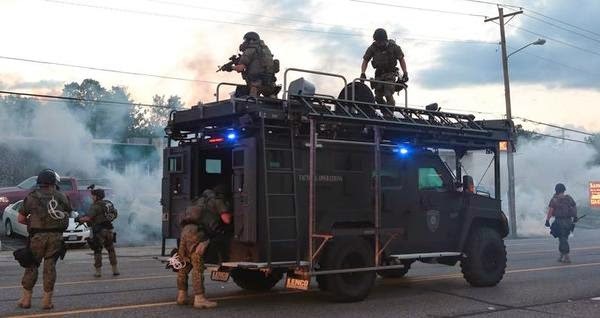 Although I have written on this blog previously about the militarization of our police force, seeing combat-style SWAT teams in full riot gear, aiming sniper rifles on peaceful protesters was appalling. 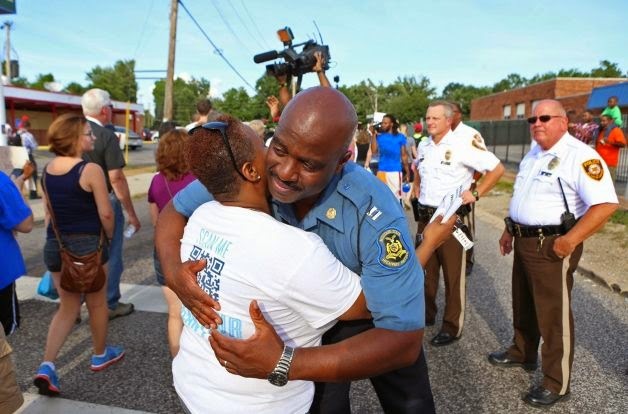 Thank goodness cooler heads have prevailed and the Fergusen and St Louis Police Departments have been taken off the case and the Missouri Highway Patrol headed by Captain Ron Johnson is in charge. Thursday night, teargas was replaced by hope. Although the people are still understandably angry and are demanding answers, there was a sea change in the mood of the protests Thursday and they were all peaceful. What a textbook example of the superiority of a community police model over one that sees citizens as the enemy and the community as a war zone. Yesterday, the Ferguson Police Chief's press conference reignited people's ire. They were expecting answers- like how many bullets entered Michael's body, what about the eyewitnesses who describe a scenario that sounds like first degree murder (the local police have so far refused to interview the eye witnesses) and how long did Michael's body lay in the street before an ambulance came? They finally did release the name of the officer who shot Michael; Darren Wilson, but they did not release the two incident reports on the shooting. The Chief instead focused all his attention on the surveillance video of Michael stealing cigars from a store and shoving the clerk, minutes before his death. The Chief went on to say the police officer stopped Michael for jaywalking and that it had nothing to do with what happened in the store. Michael's friend said the policeman yelled "Get the f--k on the sidewalk." and that is when the confrontation began. The people want to know why no warrant has been issued for the officer for the shooting and why he has not been taken into custody. The incident in the store has no relevance to Michael being killed in cold blood. There was some minor looting late Friday night. The police used restraint in dealing with it. Also telling is that a group of citizens formed a chain in front of the store and told the young people "You are better than this." 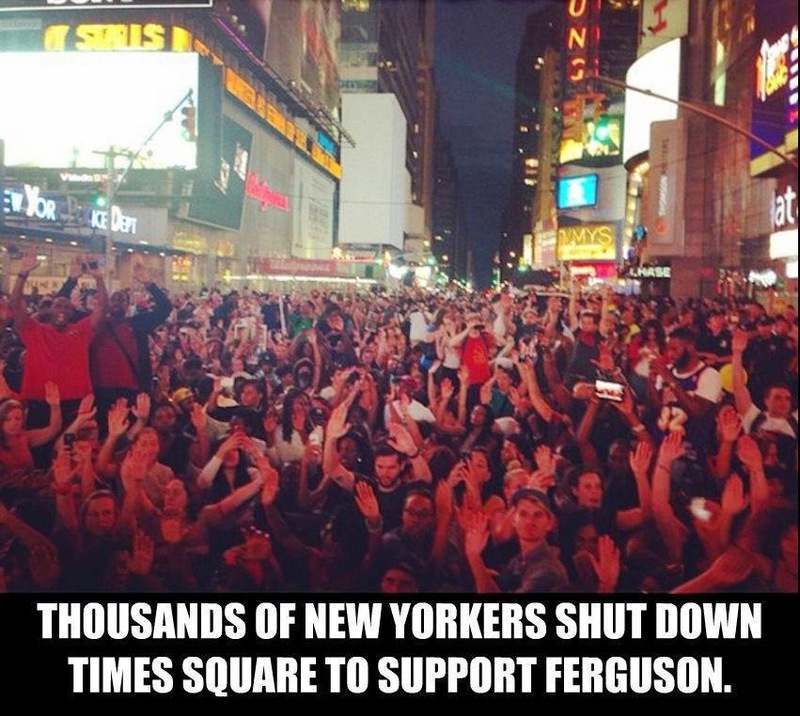 It is important to remember that the looters represent less than 1% of all the protesters. The vast majority have legitimate grievances and are expressing themselves nonviolently. The Pentagon has not only transferred M-16s, grenade launchers and armored personnel carriers to cities and towns across America, they have also transferred a mindset that says you are at war and you need to do whatever you can to defeat the enemy- in this case, the citizens of a community. That mindset is clearly entrenched in the culture of the Fergusson Police Department. They once arrested an innocent, African-American man and four officers beat him in his jail cell. He suffered a concussion and was bleeding so heavily he had to be sent to the emergency room. The police then charged him with destruction of property for bleeding on their uniforms. The "defendant did then and there unlawfully commit the offense of 'property damage' to wit did transfer blood to the uniform" reads the charge sheet. A police department that would beat an innocent man (he had a different middle name and social security number than the man they were looking for and the booking officer even said "We have a problem.") and then hold him for days for the crime of bleeding on their uniforms is indicative of how Blacks have been treated by this department for a long time. The NAACP has an ongoing federal complaint against the county police department over racial profiling. We saw the warrior mindset operating before Captain Johnson took over. The police in Ferguson assaulted and arrested journalists, pulled an alderman and others out of their cars and held them in jail overnight without charges, and shot rubber bullets and lobbed tear gas canisters at nonviolent protesters expressing their anger over another Black male being gunned down by police. A militarized police has no place in a democracy. Just as many white people are joining in the protests against police violence and for justice for Michael Brown, we all are needed to make sure reforms happen to demilitarize our police and to make community policing the model used across America. 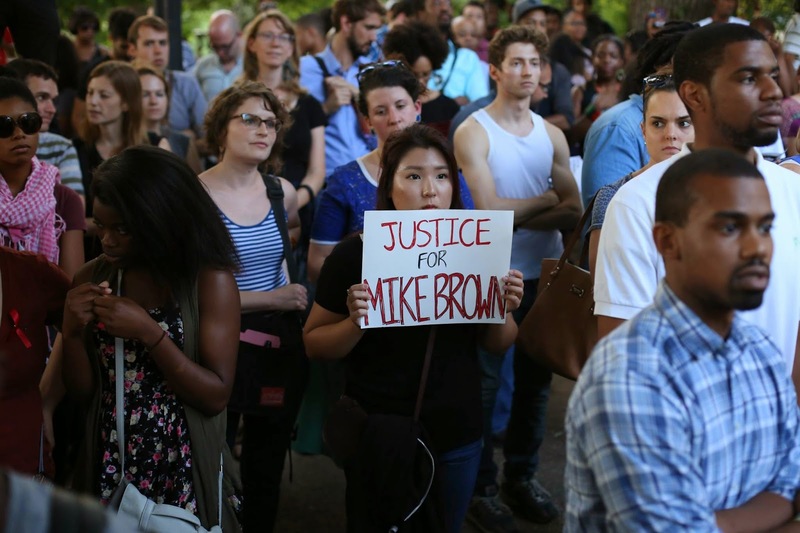 Tell the US Department of Justice and Missouri authorities to investigate the Michael Brown murder and to ensure that all police officers involved in shooting the unarmed youth are prosecuted to the full extent of the law. Sign Democracy for America's petition to stop the flow of military weapons and hardware to local police. 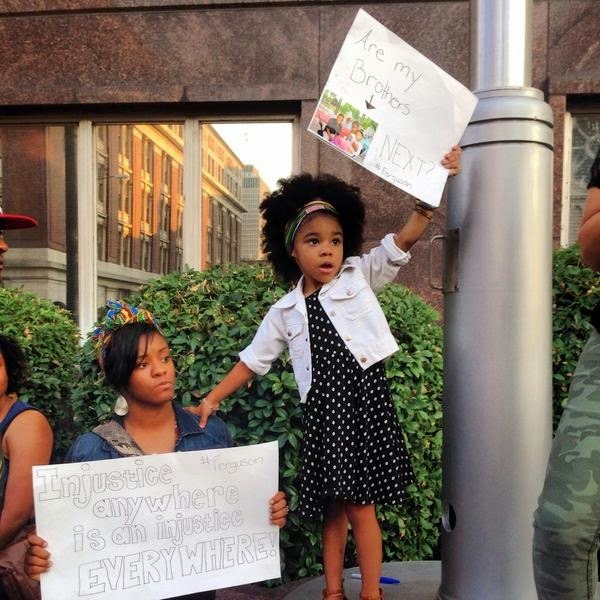 Stop the systemic police abuse in Ferguson and across this country. Demand an end to racial profiling and the mass incarceration of a generation of young Black men. 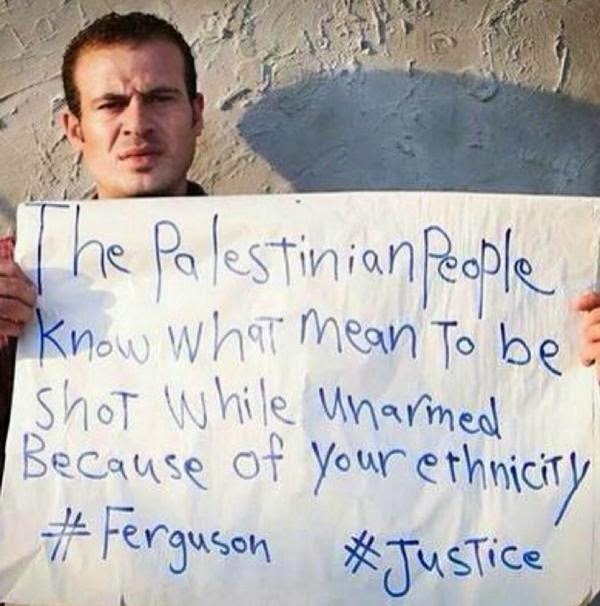 Stop the war against communities of color. Demand justice for Michael Brown. Michael Brown,18; Eric Garner,43; John Crawford, 22; Ezell Ford, 25; Dante Parker, 36; Amadou Dialo, 23; Manuel Loggins Jr, 31; Sean Bell, 23; Ronald Madison, 40; James Briseete, 17; Ramarley Graham, 18; Kimani Gray, 16; Kendrec Mc Dade, 19: Timothy Russell, Ervin Jefferson, 18; Patrick Dorismond, 26; Ousmane Zongo, 43; Timothy Standsbury Jr, 19; Orlando Barlow, 28; Aaron Campbell, 25; Victor Steen, 17; Steven Eugene Washington, 27; Alonzo Ashley, 29; Wendell Allen, 20; Tavares McGill, 16; Oscar Grant, 22; Jonny Gammage; 31. Sources- TheRoot.com, Mother Jones, philly.com The MalcomX Grassroots Movement reports that 136 unarmed African-American men were killed by police, security guards and self-appointed vigilantes in 2012 alone- so this list is just the tip of the iceberg. Stay tuned here for ongoing news from Ferguson. Concerned about GMOs? Join Us! New Paltz Celebrates Women for International Women's Day! Eye Popping Charts that Show How Our Richest 1% Is Out of Control! No Nuclear Power, No Fracking Day of Action, Workers' Rights Rally- We Are One! The Mainstream Media (MSM) creates a "spectrum of thinkable thought". Their purpose is to make money and do the bidding of the economic elite of which they are a part. They promote endless war, ignore corporate profiteering at the expense of the people and the earth, create confusion over subjects for which there is scientific clarity, distract and divide and maintain a culture of fear to make the people more manipulable. We need a diverse, independent and vibrant media for the survival of democracy. Please share these resources and support them anyway you can. We know the challenges before us are great- but not as great as what is inside us! We believe that armed with the truth, direction and a belief in our collective power- we the people will prevail. Anti-Frackers Greet Governor Cuomo at State Fair!